Aloe vera in Sebopil Pet Shampoo soothes your pet’s inflamed skin. Conditions dry & dull coat and revitalizes hair follicles, collectively, all these ingredients make Sebopil Pet Shampoo an excellent product to treat your pet for seborrhea as well as fungal infections. Aloe vera in Sebopil Pet Shampoo soothes your pet’s inflamed skin. Conditions dry & dull coat and revitalizes hair follicles, collectively, all these ingredients make Sebopil Pet Shampoo an excellent product to treat your pet for seborrhea as well as fungal infections. 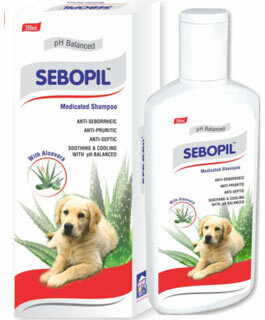 Sebopil Pet Shampoo cures seborrhoeic dermatitis or seborrhea. Seborrhoea is a skin disease characterized by a defect in Keratanization, a process by which dead skin cells are replaced by new ones. In seborrhea, dead skin cells accumulate on the pet’s body and are not replaced by new cells in time. This makes the coat appear scaly. Sodium salicylate is mildly antipruritic, anti bacterial & keratoplastic agent which normalizes keratanization (the process of new skin cells formation & replacement). By breaking the outer layer of skin,thus breaking down scales & crusts (consisting of dead skin cells) formed on the pet’s body. Accordingly the pet’s coat will appear scalier upon initial use, however, the scales will diminish with regular use. Chlorhexidine Gluconate, an antimicrobial agent minimizes presence of microbes on pet’s skin & makes the skin healthier. It controls secondary infection in seborrhea. Ketoconazole has both antifungal as well as anti -inflammatory properties. Application: Leave it for 5-10 minutes allowing Sebopil Pet Shampoo to stay on fur. Rinse thoroughly with water for effective relief, use Sebopil Pet Shampoo 2-3 times a weak initially, then once-a-week. Indications : Sebopil Pet Shampoo is ideal for pets having moderate to marked scaling & oily skin. Precautions: Keep product out of reach of children & pets to avoid unintended consumption. Avoid contact with eyes.